Sheffield, United Kingdom – Notus Games studio is pleased to announce several major updates of Christmas Mansion 3, a puzzle game for iOS that the whole family can enjoy. 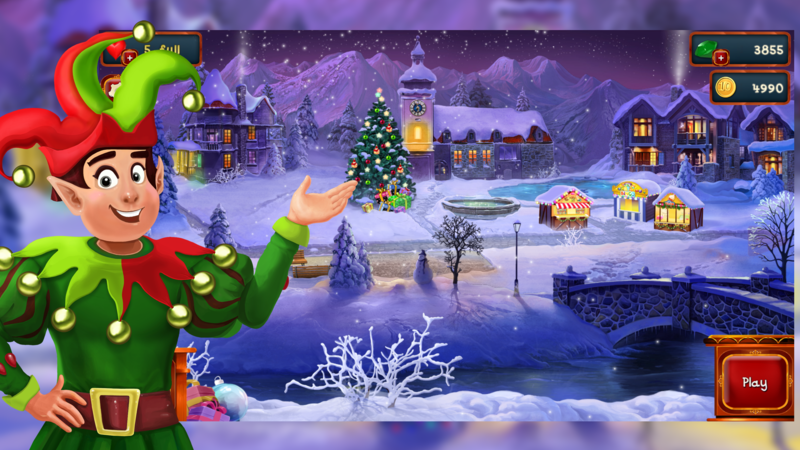 Christmas Mansion 3 is easy-to-play and nice puzzle game with fun Christmas themed quests. Help the Elf to prepare your town for Christmas with beautiful ornaments and decorations! Build cafes and shops for Christmas fair, lure cops with donuts to provide safety, organize snowball-fighting competitions, decorate the fir-tree and town hall, get beautiful ornaments, illuminations and design ice sculptures to create the real Christmas spirit. All of it happens in semi-animated location with parallax effect. So hurry up to get dozens of upgrades and decorations for your Christmas fair and earn free diamonds to charge the powerups, blast through the puzzles and have a fantastic Christmas Puzzle holiday! In the latest updates we added new levels, quests and features. The game supports Retina displays and latest iPhone X series. It is a continuation of Christmas Mansion series. In previous parts we offered player to decorate a house exterior and living room for Christmas. Now an entire town square is available to prepare for Christmas fair. Christmas Mansion 3 (v1.2.4) is available worldwide exclusively through the App Store for free for iPhone, iPod and iPad. PC and Mac versions are also available. Notus Games Ltd is a rapidly developing company founded in 2010. Copyright (C) 2010-2018 Notus Games Ltd. All Rights Reserved. Apple, the Apple logo, iPhone, iPod and iPad are registered trademarks of Apple Inc. in the U.S. and/or other countries.